In November 2012, Sheila Coultas made a decision to make big life changes. She left her job as a seamstress and in the same year, sold her house and bought another. A previous graduate of the Textiles Studies in 1997, Shelia felt there was still something more. 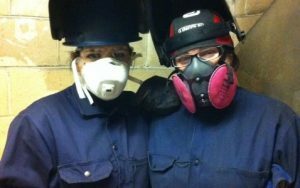 With the support of her family, she learned about Women in Resource Development Corporation’s (WRDC) Orientation to Trades and Technology (OTT) through her mother. She immediately scheduled an appointment and met with a WRDC Career Development Coordinator (CDC). With hard work and dedication Shelia won the Vale Maintenance Trades Bursary, worth a total of $1000 in her first semester, and continued her hard work to win the James Sellars’ Apprenticeship Award the following semester, worth $7000. Shelia has since graduated with top marks and won the President’s award for the highest average in her program. She is very proud of the changes and accomplishments she made in her life. “I couldn’t have done it without the steps I’ve taken with WRDC to change things for myself,” says Shelia. Shelia encourages other women and young girls to try trades, technology and operations careers. “I personally find it rewarding. Work hard and take in as much as you can. Everyone can teach you something and enrich your own experience I’d you choose to pay attention.